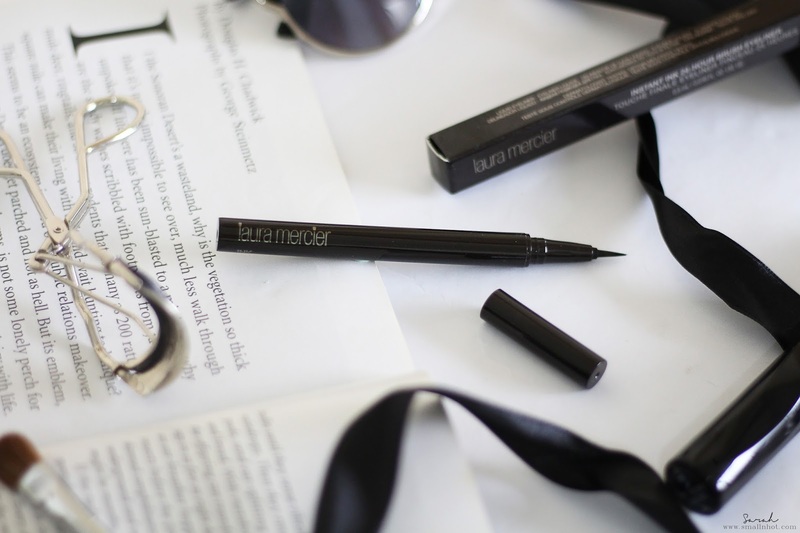 Laura Mercier Instant Ink 24H Brush Eyeliner - A Catch Or Not ? Related post : LANCÔME Grandiôse Liner - Bendable Eyeliner Gimmick ? Instant Ink 24-Hour Brush Eyeliner has a super-fluid formula and flexible, soft brush tip combine to create an endless range of lines and shapes. This water-proof, transfer resistant liner provides intense colour with smudge proof results. 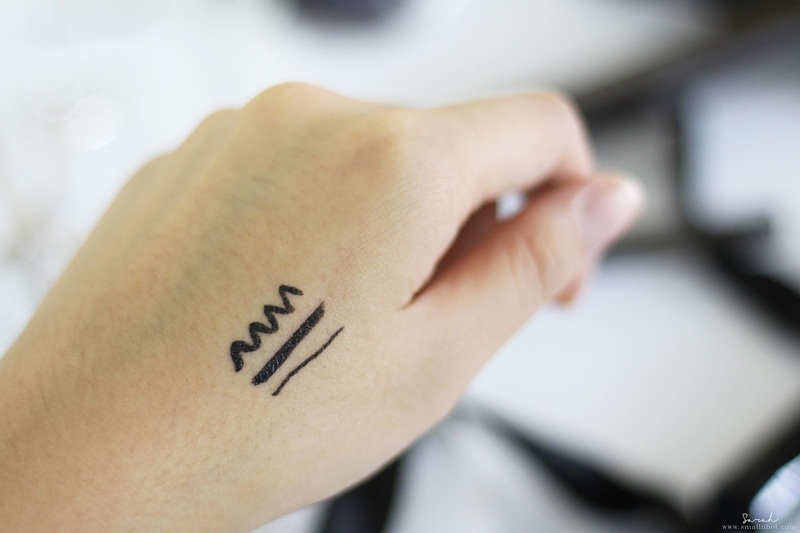 You'll LIKE it if you like liquid eyeliner with a felt-pen tip and glides on smoothly on your eyelid. You'll HATE it if waterproof is what you are after, you won't find it here. As for the color, it's an intense jet black color, there is no grey or warm tones to be seen here. Also it stays put, doesn't move around throughout the day when I apply this, unless you were walking under the rain or literally swimming with it. Then you might have the result of looking in the mirror halfway through the day and find yourself with your eyeliners chipping off from your face. The downside for this Laura Mercier Instant Ink 24H Brush Eye liner is that, it's no where near to waterproof. All you need is some water and tissue, and you can easily remove the eyeliner just like that, which is very disappointing. 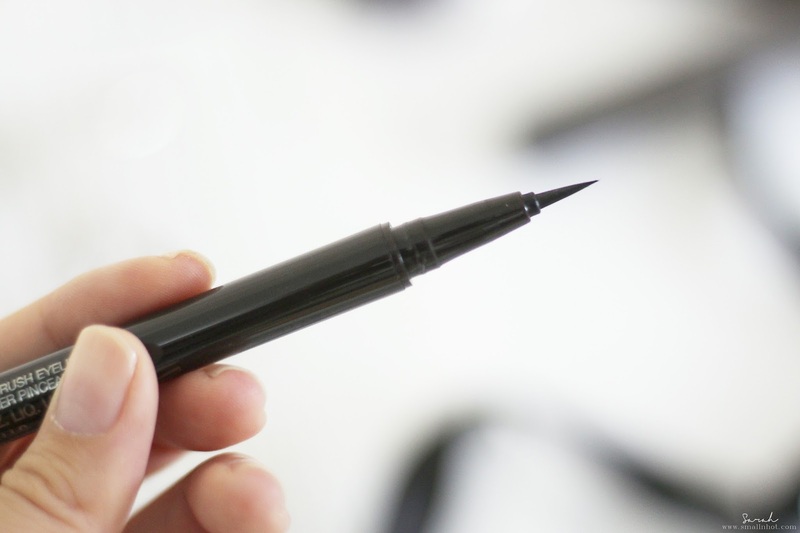 So if you are up looking for some waterproof eyeliner, then the Laura Mercier Instant Ink 24H Brush Eye liner is not what I would recommend but transfer-resistant and smudge-proof wise, this does check the box. Now here comes the million dollar questions, will I be repurchasing it ? I highly doubt so, because for half the price, I could get the Dolly Wink Liquid Eyeliner that comes with a similar brush tip and delivers the same transfer resistant and smudge proof result. So why pay more ? * Available at Laura Mercier counters (Malaysia) : 1 Utama, Pavilion KL, The Gardens Mall, Bangsar Village II, Sunway Pyramid, Empire Shopping Gallery, Sunway Putra Mall, Penang Gurney Plaza. * Available at Laura Mercier counters (Singapore) : TANGS Plaza, Takashimaya Dept. Store, Robinson The Heeren, Robinsons Raffles City Beauty Hall, Sephora outlets in ION Orchard, Takashimaya, Plaza Singapure, Great World City, Marina Bay Sands, Bugis, VivoCity, JEMS, Suntec, NEX, Tampines.